Many thanks for these changes! The custom library icons all load correctly. I do sometimes get an 'out of memory' message when I open the 'Properties' menu, though. It seems to hinder changing the appearance, although simply opening 'Properties' again will resolve the issue. With 2.7 the flyout menu textcolor is the same as "StartPanelPriv > ProgramsList"
Earlier version had always black text color. Is there any way to change it, keeping the left panel light gray? - Support for extended (shift+right-click) context menu for UWP apps: Copy path (AppID) and Open Folder. Any chance of adding the dark plain8 theme to previous Windows 10 builds? Or is the new dark explorer Windows code needed for this? No chance in hell. 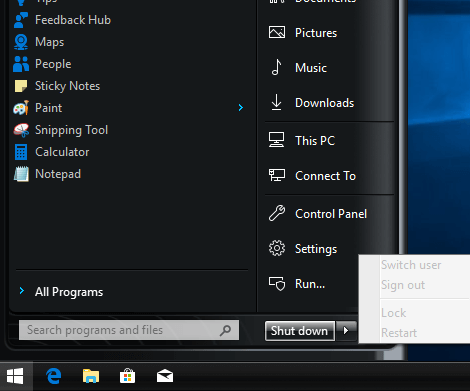 You have to run hot shitpot latest Win10 is. You have to run hot shitpot latest Win10 is. Try: "You have to run [the] hot shitpot [that] latest Win10 is." It means: "You have to run the wonderful latest Win10", of course! That is really sad he feels that way. 2.8 beta , Centered task icons works on Windows default but does not work on 3rd party themes.